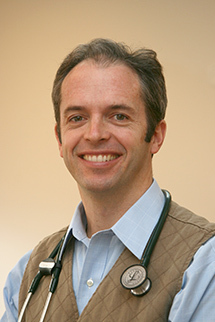 Dr. Daniel Goodyear has lived in Vermont since 1996, hailing originally from Pennsylvania and Cape Cod, with stints in Colorado and Alaska before happily settling here. He is an active person, and enjoys all that Vemont has to offer for back-country skiing, running, hiking, and camping. He lives in a solar powered house with his wife and two children, who all join with him in maintaining extensive gardens in the summer. Dr. Goodyear's interests in medicine are in preventative medicine for all ages, optimizing health and wellbeing in the setting of chronic illness, helping coordinate care in the complex environment of specialized health care when needed, ensuring athletes can maintain a healthy and active lifestyle, and finding personalized ways to encourage more activity for those with sedentary lives.